The Maine Center for Disease Control has confirmed that an adult from York County who died in October was confirmed to have Eastern Equine Encephalitis, which marks the first recorded case of death from EEE in the state. The person, an adult who was at least 65 years old, was not identified. The victim became ill in September and was admitted to a New Hampshire hospital Sept. 30. The victim then died Oct. 17. Test results were inconclusive and were sent to Colorado for further evaluation. The Maine CDC received the confirmation last week. "Our hearts go out to the family during this difficult time," said Maine State Epidemiologist Siiri Bennett. 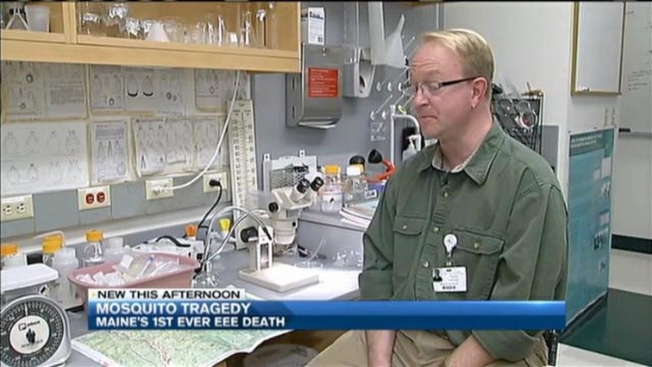 "As this disease is transmitted through a bite from a mosquito, it's important for Mainers to know that there is no current risk of EEE in Maine." Rates of EEE-infected mosquitoes and wildlife in New England have surged over the last decade, according to researchers at Maine Medical Center's Vector-Borne Disease Lab. "We're really seeing it ramp up, especially in northern parts of New England," said Vector Ecologist Chuck Lubelczyk. "We're finally seeing it arrive in people, so I think it's really in the land scape now, and people should be aware." Dr. Lubelczyk said the best way to protect from EEE is to wear long sleeves and insect repellent when outside in the warmer months. He said symptoms of EEE include headaches and brain swelling. It can lead to permanent brain damage, and roughly 33 percent of cases end in death.